Brooke Alfaro. Aria. Video. 3:20 min. 2002. Rosangela Renno. Experience of Cinema. Video installation. 2004. When video began being used by artists, its position within the art world was clearly ambiguous. Any production made by an artist with a video camera was considered an art piece within the newly born category of “video by artists”. It didn’t matter if it was the documentation of a performance, a lyrical vision of reality or the result of electronic manipulation of images; the presence of an artist behind the camera was enough to turn it into video art. During the eighties, video art was sharpest defined as an experimental research with the electronic image. This experimental trend separated from other uses of video and built its own circuit of exhibitions and festivals. Some artists became referents and a distinct group of critics and curators supported the autonomy of the new media. But in the last years, it can be said that video art is in a process of des-definition, and that for many reasons. On one hand, digital technology has widened its scope and confronted it with the new digital forms. Video has now to compete with net.art and streaming media, digital animation and interactive CDs. Most video festivals have turned into media art exhibitions posing video art as one of many attractions. And at universities, technological art research has also moved to the digital field. On the other hand, video has flourished among visual artists, but their approach often neglects the specificity and history of video art. Most of these artists move easily in the circuit of galleries and biennials, where video installations are preferred to mono-channel pieces, while traditional video artists have a hard time to do it. And eventually, the introduction of video into the film industry has seduced some video art makers to try their luck in the world of cinema. Latin America is not an exception in this panorama. The same trends are developing inside the video art world hardly constructed during the eighties and the beginnings of the nineties. VideoBrasil, the oldest festival of the continent, includes today all kind of electronic production, while festivals born in the nineties like the Bienal de Video de Santiago and the Festival Internacional de Video Arte de Peru moved quickly from video to media art. Events devoted only to video like the Festival Franco-Latinoamericano de Video Arte and the Festival de Video del Cono Sur have disappeared. Simultaneously a growing number of Latin American artists show video in solo and group exhibitions in galleries and museums, many of them being also national representatives in art biennials and other international events. Some of these artists have had an outstanding presence in video art festivals, like Eder Santos and Lucas Bambozzi (Brasil), Gabriela Golder, Marcello Mercado and Charly Nijensohn (Argentina) or Manolo Arriola and Ximena Cuevas (Mexico), to just mention a few. Others have always oscillated between video art festivals and visual arts exhibitions, like Jose Alejandro Restrepo (Colombia), Carlos Trilnick (Argentina), Rosangela Renno (Brasil), Jose Antonio Hernandez-Diez (Venezuela) or Lotty Rosenfeld (Chile). But the artists that move better within the art circuit of exhibitions are sometimes newcomers, young creators that just begin their careers or older ones that have began using video recently. Most of these artists have a history or education in the visual arts. The list is endless, but some examples are: Martin Sastre, Pablo Uribe (Uruguay), Miguel Calderon, Yoshua Okon, Ruben Gutierrez, Fernando Llanos (Mexico), Carolina Saquel (Chile), Priscila Monge (Costa Rica), Angie Bonino, Ivan Esquivel, Jose Carlos Martinat, Roger Atasi (Peru), Ana Claudia Murena, Andres Burbano, Freddy Arias (Colombia), Brooke Alfaro (Panama). Their works include video, installations, performances and digital technologies, refusing any easy categorization. From an aesthetical point of view, one of the main currents in Latin American video art is the political one, where politics must be intended in a real broad sense. In a way, it could be possible to say that Latin American video art has long been a laboratory of proposals to test the different ways artistic discourse addresses political referents or can be considered a political discourse in itself. Some Chilean video pieces are paradigmatic of the last case. In a country where the responsible for the death, torture and disappearing of people during the seventies, Augusto Pinochet, is still part of the government, and where both the ruling classes and large parts of society are trying to erase the memory of that time, the insistence of Edgar Endress, Guillermo Cifuentes, Claudia Aravena and Lotty Rosenfeld in remembering those acts cannot be understood only as aesthetic proposals but also as political statements: an affirmative stance on memory in a country that push for forgetting. 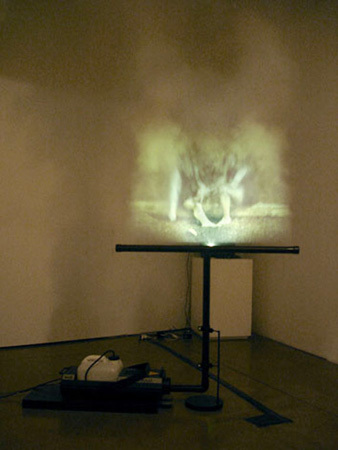 The confrontation of past and present is central to many other video artists. Jose Alejandro Restrepo has resorted to Colombian history in his video and video installations to unveil the historical roots of some everyday practices. In their videos, Pablo Uribe has addressed the influence of tradition through historical imagery and Alvaro Zavala has confronted the careless life of wealthy Peruvian youth with the Inca legacy. In the last years, a group of Argentine artists has worked with the images of the violent events that broke out after the institutional crisis of 2001, and some video makers have recovered the tradition of militant cinema in a series of activist videos. Documentary has a long heritage in Latin American film and it is still the basis of many Argentine artists, like Ivan Marino and Hernan Khourian. Political gaze has a very different appeal in the work of some young artists. They prefer parody and irony to denounce and testimony, in order to exhibit their social concerns and criticize stereotypes. This has been the approach chosen by Mexicans Yoshua Okon and Minerva Cuevas to reflect on authoritarianism and violence, or by Uruguayan Martin Sastre to comment on the lack of opportunities of Third World artists in the international art circuit. Gaston Duprat and Mariano Cohn have cultivated a deep sarcastic viewpoint on some typical Argentine behaviors and attitudes, while Priscila Monge has focused on stereotypes and commonplaces to inquire about the position of women in contemporary societies. Brazilian artists have often devoted to highlight the sensorial aspects of electronic media in a way that seems to recover the legacy of key figures form the sixties like Helio Oiticica and Lygia Clark. 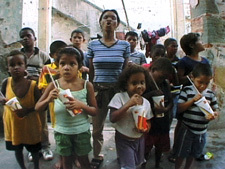 This sensorial trend is also visible in many developments in the area of the digital arts and interactive installations, where artists like Gilbertto Prado, Diana Domingues, Suzette Venturelli or Rejane Cantoni have long researched on ways to improve audiences’ involvement with electronic works through sensibility and emotion. Digital media and interactivity are widening the relationships between people and electronic productions. 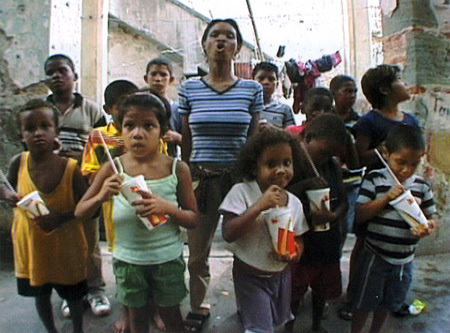 Brazilian Marcia Vaitsman has created a non-linear video on DVD that allows the user to chose his/her own path through the narrative, while Argentine Ivan Marino has done more or less the same but using streaming technology and the world wide web, so any user connected to Internet is invited to built his/her own story from video footage recorded by the artist. In the sphere of interactive installations the artworks ask also for people participation, not only by intervening on the flow of images or the construction of stories but mainly acting physically. Many different techniques have been tested in order to improve people involvement; some of them required the development of new interfaces and complex technological systems. Brazilian artists count on a solid technological structure provided by the universities. Their works are often very sophisticated and have a tendency to lay on data and objects manipulation. 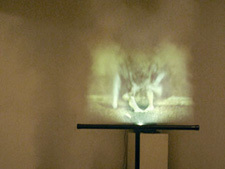 Argentine Mariano Sardon prefers using mapping techniques to induce interaction; people produce changes in the piece by walking or moving within a controlled space where technology is hidden. His production is quite rare in Argentine but recent institutions like Fundacion Telefonica and CheLa (Centro Hipermediatico Experimental de Latino America) augur a promising future for Argentine technological arts. Mexican Centro Multimedia is the pole that congregates and promotes the growth of national electronic and digital arts. In their premises, a group of works using robotics, stereo images, augmented reality and multiple forms of interactivity have taken place. The Universidad de Los Andes, both in Colombia and Venezuela, encourages electronic and digital production focusing on the relationship between art and science. Other important institutions in Colombia are the Universidad Javeriana and the Universidad de Caldas, which has created a significant Festival Internacional de la Imagen. Peruvian Alta Tecnologia Andina contributes to this panorama managing recourses to foster national and international artists to find their way in the technological productions, coming along with a myriad of Latin American institutions, artists and theoreticians involved in the expansion of electronic and digital fields, towards a des-definition of (traditional) video art. ISEA Newsletter, # 100, April - May 2005.